Ray Poynter and Radio #NewMR interviews Divya Nagarajan from Givaudan about the future of insights. Are you asking survey questions the way you were taught 20 years ago, or are you learning from recent ‘Research on Research’? Barney Larkin from Further shares a case study of how they helped VouchForMe disrupt the insurance market with new thinking and new technologies. In this Radio #NewMR Interview Ray Poynter talks with Pernod Ricard’s Corneliu Vilsan about the future of client insight functions. Posted by Ray Poynter, 9 February 2019. At this time of the year, I find that I am in demand to help organisations take a wider view of the market to help them assess their plans. These sessions can include face-to-face sessions and virtual sessions, with clients, agencies, and suppliers to the market research industry. If you are interested in the sorts of things I talk about in these sessions, you want to check our one or more of the following: A Market Research State of the Nation Review, GreenBook Predictions and Themes For Market Research & Insights in 2019, NewMR Global Prices Study – What will data, research and insights cost in 116 countries? 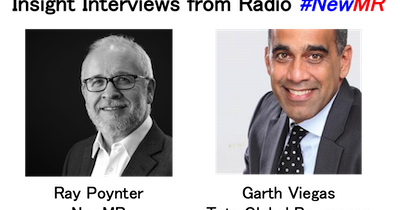 ESOMAR RW Connect Insight Interview with Garth Viegas from Tata Global Beverages – The Future of Client Insights, NewMR Interested in commissioning Ray to run a session for you, online or face-to-face? Click here to download an example presentation deck, with details of prices on the last page. Ray Poynter interviews Garth Viegas (Director of Insights at TATA Global Beverages) about the future of client-side Insight Functions. Text with Podcast.